SunPower's stock is on a tear again today, jumping 15% as I'm writing. 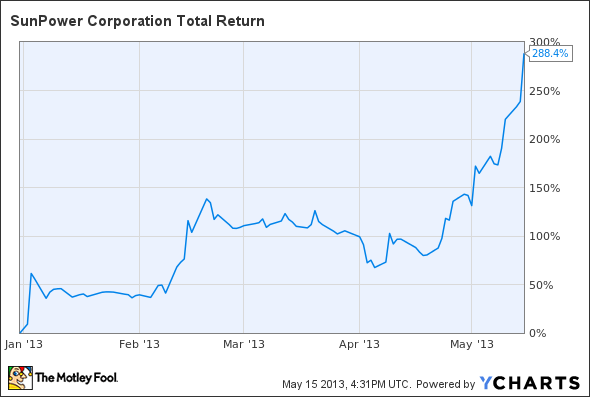 Year to date, the stock is up 288% and the chart is almost a straight line higher since the middle of April. Today, the driver was SunPower's second quarter and 2013 guidance, announced at an analyst day meeting. As you can see below, most expectations are better than Wall Street was looking for, and the stock is up as a result. Source: SunPower and Yahoo! Finance. Note: All figures are non-GAAP. Let's not forget that SunPower's management has made a habit of sandbagging expectations; my target is still $1 per share in non-GAAP EPS this year. The presentation management gave laid out why SunPower is one of the top stocks in solar. Here are a few highlights. Between 2012 and 2015 panel efficiency is expected to increase 10% to 23%. Over the same timeframe cost per watt is expected to decrease 35%. SunPower expects to raise $3 billion in aggregate global capital to fund projects and leases. Due to higher efficiency and lower degradation a SunPower rooftop system can produce 75% more energy than a comparable size from a commodity panel. By 2015, the company expects to offer an energy management system and energy storage to go along with current installation services to distributed grid customers. SunPower is the U.S. market share leader in both residential (22%) and commercial (11%) solar. SunPower and First Solar have both issued better than expected guidance this year, which is driving both stocks higher. Falling costs and lucrative contracts for huge systems will drive this year's results for both companies but it's the lead that SunPower is building in distributed generation that I think will drive the stock over the long term. In the distributed business, SunPower also appears to be outperforming SolarCity , the installer who purchases third-party panels. SolarCity reported a loss greater than its revenue in the first quarter at the same time as SunPower's bottom line is improving. There are two reasons for this. First, SunPower's superior efficiency means it can pack more megawatts of power onto a roof. Second, it relies on its dealer network to market sales, which cuts down on operating expenses. Today's guidance, and SunPower's continued improvement in both the distributed and utility spaces, will keep SunPower as my top stock in solar. The sky is the limit for this stock. Investors and bystanders alike have been shocked by First Solar's precipitous drop over the past two years. The stakes have never been higher for the company: Is it done for good, or ready for a rebound? If you're looking for continuing updates and guidance on the company whenever news breaks, The Motley Fool has created a brand-new report that details every must know side of this stock. To get started, simply click here now. The article SunPower Continues to Befuddle Wall Street originally appeared on Fool.com. Motley Fool contributor Travis Hoium owns shares of SunPower in both a personal and managed account and personally has the following options: Long Jan 2015 $7 Calls on SunPower, Long Jan 2015 $5 Calls on SunPower, Long Jan 2015 $15 Calls on SunPower, and Long Jan 2015 $25 Calls on SunPower. The Motley Fool has no position in any of the stocks mentioned. Try any of our Foolish newsletter services free for 30 days. We Fools may not all hold the same opinions, but we all believe that considering a diverse range of insights makes us better investors. The Motley Fool has a disclosure policy.